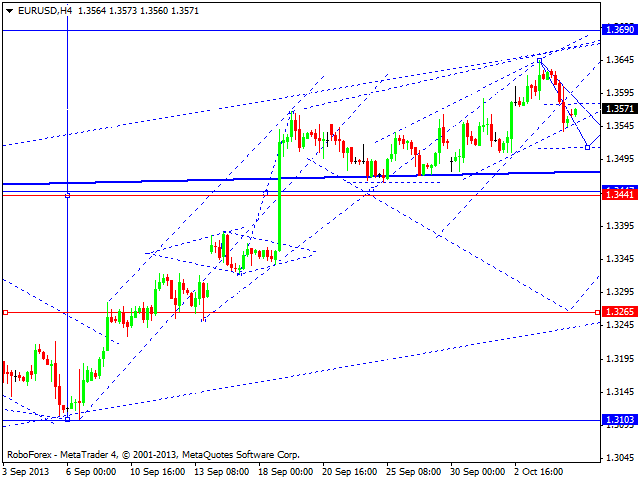 Euro is trying to return to the level of 1.3585. 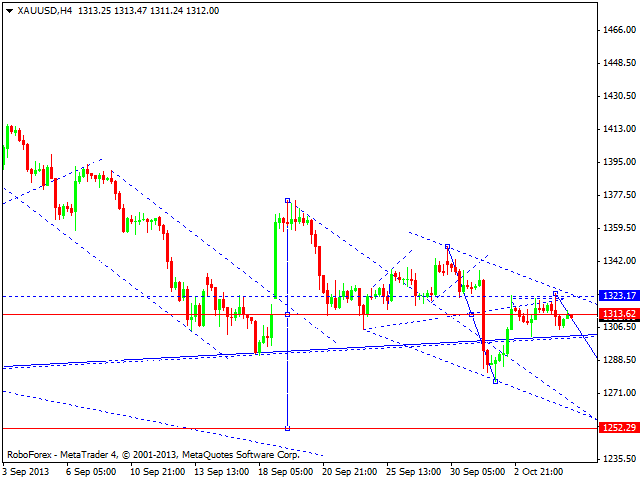 We think, today the price may reach this level and the fall down towards the target at 1.3515. Later, in our opinion, the pair may start a correction back to the level of 1.3585 and only after that we’ll if the price is going to start a deeper and longer correction. However, the main scenario implies that the market may reach new maximums and after that make another attempt to start a correction of form a continuation pattern. Pound is moving inside a descending structure, which, in our opinion, isn’t going to transform into a serious correction. We think, today the price may leave this descending channel and start growing up to reach a new maximum at the level of 1.6290. Only after that, the pair may start a correction. 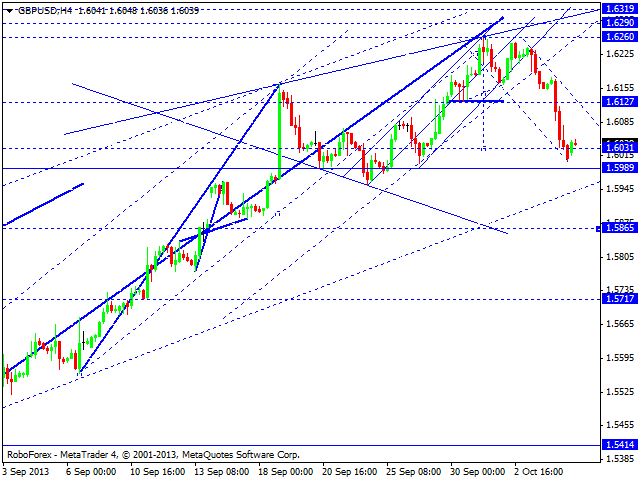 Franc is forming an ascending wave with the target at 0.9087. After reaching this target, the price may start a correction of this wave. However, we should note that right now, the market shows no signs of a deep correction and the pair is expected to reach a new minimum. The USD/JPY currency pair is still forming its descending structure. 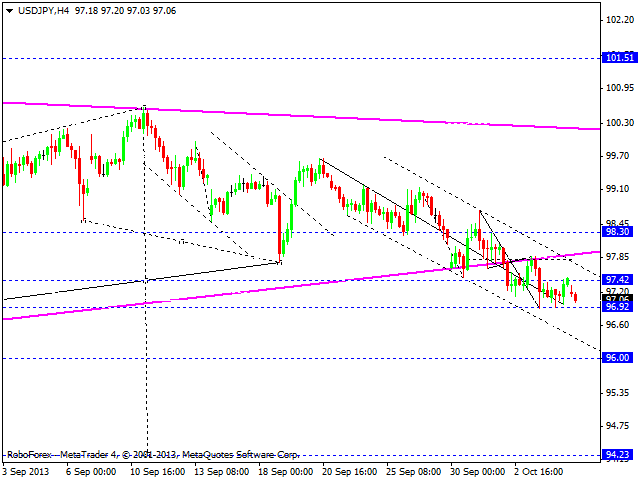 We think, today the price may reach a new minimum and then return to the level of 97.40. Later, in our opinion, the pair may continue falling down towards the target at 96.00. 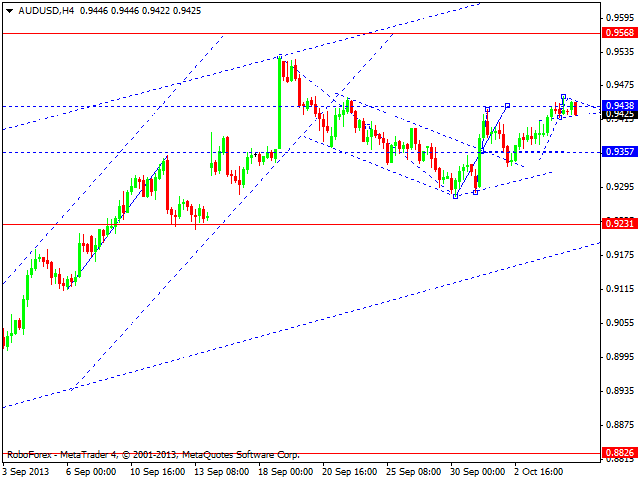 Australian Dollar continues forming a descending structure. 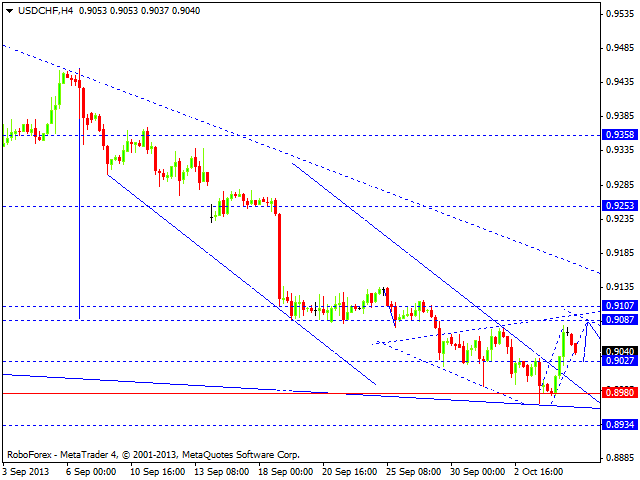 We think, today the price may reach the level of 0.9230. Later, in our opinion, the pair may form a reversal structure for a new ascending movement towards the local target at the level of 0.9565. Gold is still falling down. We think, today the price may reach the level of 1288. Later, in our opinion, the instrument may consolidate for a while and then continue moving downwards to reach the local target at 1252.